For the first time, astronomers have produced a complete description of a black hole, a concentration of mass so dense that not even light can escape its powerful gravitational pull. Their precise measurements have allowed them to reconstruct the history of the object from its birth some six million years ago. Using several telescopes, both ground-based and in orbit, the scientists unravelled longstanding mysteries about the object called Cygnus X-1, a famous binary-star system discovered to be strongly emitting X-rays nearly a half-century ago. The system consists of a black hole and a companion star from which the black hole is drawing material. The scientists' efforts yielded the most accurate measurements ever of the black hole's mass and spin rate. "Because no other information can escape from a black hole, knowing its mass, spin, and electrical charge gives a complete description of it," said Mark Reid, of the Harvard-Smithsonian Center for Astrophysics (CfA). "The charge of this black hole is nearly zero, so measuring its mass and spin make our description complete," he added. Though Cygnus X-1 has been studied intensely since its discovery, previous attempts to measure its mass and spin suffered from lack of a precise measurement of its distance from Earth. Reid led a team that used the National Science Foundation's Very Long Baseline Array (VLBA), a continent-wide radio-telescope system, to make a direct trigonometric measurement of the distance. Their VLBA observations provided a distance of 6070 light-years, while previous estimates had ranged from 5800-7800 light-years. "This new information gives us strong clues about how the black hole was born, what it weighed and how fast it was spinning," Reid said. "Getting a good measurement of the distance was crucial," Reid added. "We now know that Cygnus X-1 is one of the most massive stellar black holes in the Milky Way," said Jerry Orosz, of San Diego State University. 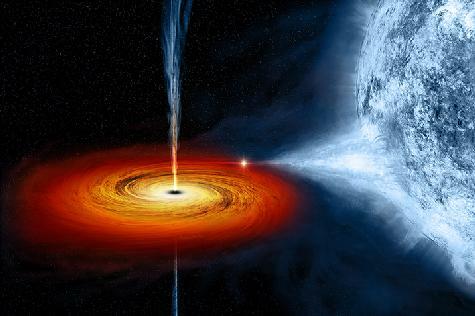 "It's spinning as fast as any black hole we've ever seen," he added. In addition to measuring the distance, the VLBA observations, made during 2009 and 2010, also measured Cygnus X-1's movement through our Galaxy. That movement, the scientists, said, is too slow for the black hole to have been produced by a supernova explosion. Such an explosion would have given the object a "kick" to a much higher speed. "There are suggestions that this black hole could have been formed without a supernova explosion, and our results support those suggestions," Reid said. Reid, Orosz, and Lijun Gou, also of CfA, were the lead authors of three papers on Cygnus X-1 published in the Astrophysical Journal Letters.